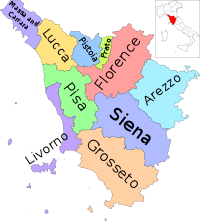 The Province o Pisa (Italian: Provincia di Pisa) is a province in the Tuscany region o Italy. Its caipital is the ceety o Pisa. It haes an aurie o 2,448 km², an a total population o 394,101 (2005). There are 39 comuni in the province . Pisa is well kent for the famous Leanin Touer o Pisa, which is locatit in the ceety. It brings hintle tourism tae this aurie.